A month has passed me by and I haven’t shared any of my dragon-slaying adventures. Okay – I don’t really slay dragons. But I do consider deadline days (every Tuesday, every other Friday and the occasional triple week) a mythical beast that needs to be destroyed so my sanity can recover before the next great battle. My armor is usually a t-shirt over a long sleeve thermal and a hoodie. My weapons of choice vary week to week, often day to day. I think my hands have issues. I need the pen to feel right so I can attack the multi-headed deadline beast-of-evil properly. Have you dropped by the #DailyArsenal group on Flickr? We snap photos of what we use during a day and often share the same on Twitter and now even on Instagram. The more the merrier so feel free to join the fun! Matt and I recently enjoyed a trip to the library. I have a bad habit of grabbing too many books. I almost wonder if it’s an unspoken challenge my mind has with my body. “Let’s see how many you can carry before they spill all over the floor and you look like a klutz.” So far my body has held up it’s “No looking like an uncoordinated goof in public” vow. I’m very grateful. I grabbed the bottom right book from the same section as “Feed”. They were on the “New Fiction” shelves. Then I wandered toward the Young Adult section and saw the bottom left book on the New Arrivals shelf. It’s basically the same cover image so of course I juggled the books in my arms to check – Yup, very similar and both about zombies. Yay zombies! 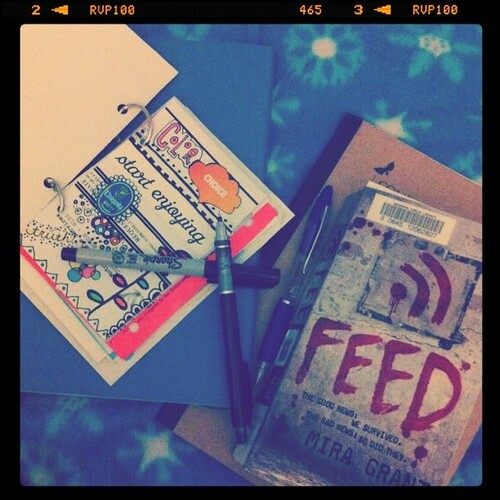 I started reading FEED by Mira Grant while Matt perused the movie section. It’s a really good read so far. I’m on page 200 or so. I like it. I’m a zombie fan. I can’t help it. Speaking of zombies, those lovable reanimated corpses that try to eat your brains – I purchased DiySara.com. Okay so my new website isn’t a zombie because it’s not live yet but… it is trying to eat my brains. Oddly enough I find myself worrying more and more about it and doing less and less with it. Don’t fret though, I will get it up and running and eventually have all these posts moved over. I guess I’m putting too much pressure on myself. I’m good at that. I’ll close this out with one of my favorite Iggy photos from this past week. He did not want to get up Thursday morning and I can’t say I blame the pup. In all honesty, Iggy would happily sleep until after noon most days and forgo the morning potty outting. He’s such a character. It’s getting late and I have much to do on my list. Thank you for dropping by and please take care. OMG, the Iggy photo is ADORABLE. Iggy is ADORABLE. He has such beautiful eyes. They convey such great emotion. 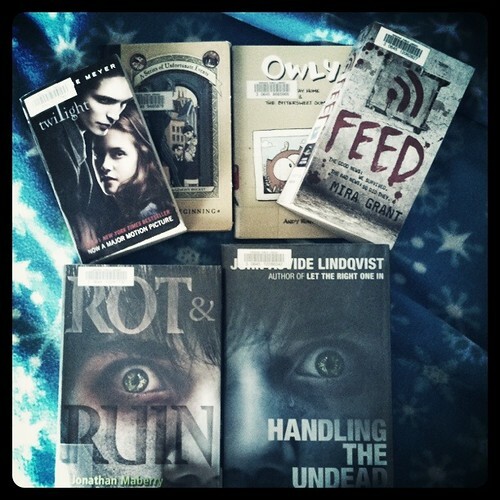 Looks like we’re reading the same books, although I have Feed and Handling the Undead in audiobook format. Mira Grant is the nom de plume for Seanan McGuire, who writes the October Daye stories which I love (urban fantasy). Switching from wordpress to your own url. You’re my hero. I need to switch my blog over to a url, but what url to go with…hrm…still thinking on that one. Be kind to yourself and patient. It’ll all get done in it’s own time. Just keep being awesome. And posting your awesomeness for all of us to enjoy. p.s. 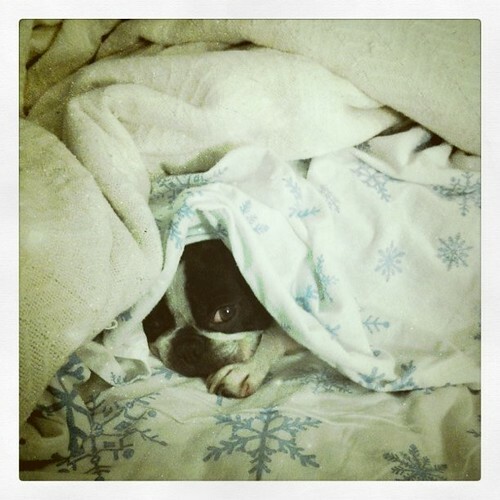 Iggy’s cuteness is making me weak. LOL! I’m not allowed to go to the library anymore. I always come home with way too many books. (Obviously doesn’t stop me anyway.) Library trips are great because there’s such a WEALTH of possibilities. Although I’m not a zombie fan. I’ve thought about the practicalities of eating someone’s brain without a drill or a bandsaw. It’s not pretty. Bonne chance with the website! how do you do the effect in this photos? I like so much.